First Edition. Opening page with title set within woodcut floral border. Biographical poem at beginning. ff. 78. Stained throughout, opening three leaves and final leaf repaired affecting some text, small wormhole on opening leaves, previous owners’ inscriptions and stamps. Modern vellum. Folio. Vinograd Naples 5; Offenberg 91; St. Bodl. 3953; Goff Heb-81. [Naples: Joseph ben Jacob Aschkenazi Gunzenhauser], 1488. RARE. A Biblical dictionary, the Hebrew explained in Italian and Arabic along with Talmudic citations. Most bibliographers attribute the author’s name to be one Yechiel, which appears in an acrostic poem at the end of the preface. However, based upon a manuscript, Vinograd points to the author as being Peretz Trabot, who flourished in the late 14th- century. See S.L. Einbinder, No Place of Rest: Jewish Literature, Expulsion, and the Memory of Medieval France (2008) pp. 140-1. The opening leaf of this book contains what may well the first separate title-page in a Hebrew book. 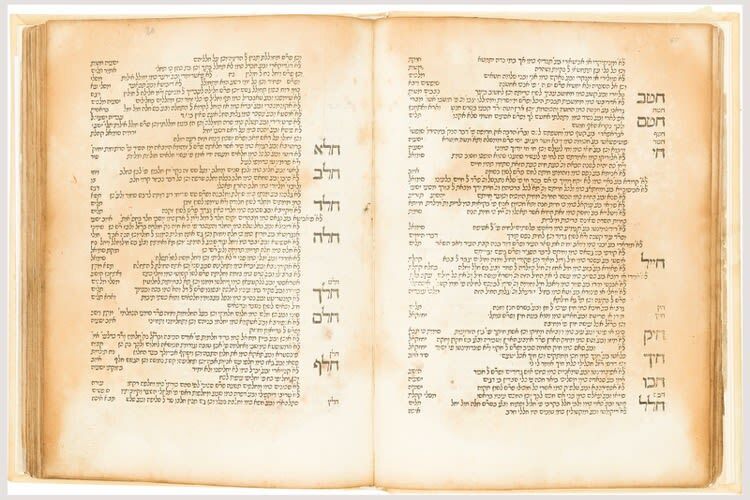 Scholars usually record the first Hebrew Book to appear with a title-page to be the Sepher Rokeach printed in Fano, 1505 (see lot 103). Another copy of this rare incunable appeared in the Delmonico Collection (see Sotheby’s New York, 17th December 2008, Lot 51).